The human immune system has evolved into a potent instrument to fight disease and foreign pathogens. It must, however, maintain an exquisite balance between eliminating pathogens and disease while sparing normal tissues. The immune system accomplishes this via a series of inhibitory receptors designed to limit unwanted immune responses. Unfortunately, these limiting inhibitory mechanisms can be utilized by cancer cells to evade immune recognition. Conversely, when these limiting inhibitory mechanisms fail autoimmune/inflammatory disease is the result. Fortunately, knowledge of the immune system is more advanced than ever. 2010 saw the approval of the world’s first active immunotherapy, designed to train the body’s immune system to fight prostate cancer. 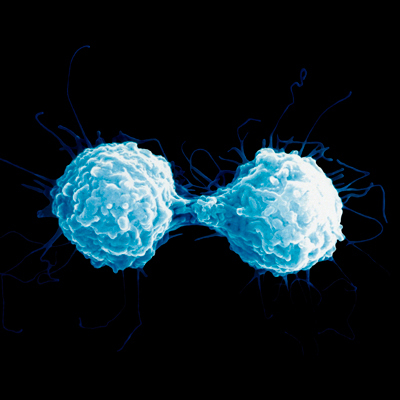 New immunotherapies to fight melanoma, bladder, and lung cancers have followed – with more FDA approvals in the pipeline. 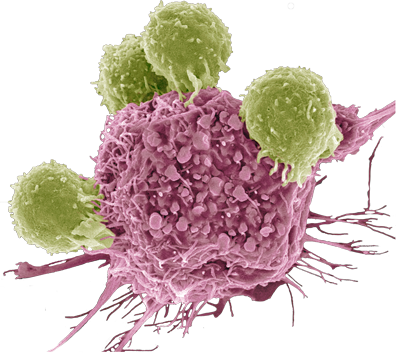 Medical science is at the beginning edge of enabling the human immune system to eliminate cancer. At Alpine Immune Sciences, we are seeking to apply our variant Ig domain (vIgD) technology to bring innovative potential new therapies to people living with cancer and autoimmune/inflammatory disease. We believe engineering native immune system proteins to improve their functionality could generate a novel class of protein therapeutics holding the key to optimally controlling the power of the immune system. Our discovery platform and translational expertise represent a scientifically and clinically unique approach with the potential to generate modern, effective, and affordable immunotherapies. The field of immunology exemplifies how the study of complex biological systems can translate into more effective therapies. Scientists have made large strides identifying key components and critical pathways of the immune system. There are still many gaps existing in what scientists have discovered and are able to modulate in the human immune system. For example, many extracellular and intracellular protein functions are executed through complex multi-protein interactions, yet our industry still looks at targeting individual proteins within these complexes. Alpine Immune Sciences is at the leading edge of defining these complex interactions and looks to leverage its proprietary platform to modulate complex protein-protein interactions inaccessible to other technologies. The immune synapse is an example of an extraordinarily complex cellular communication strategy taking millions of years to evolve. In the cellular contact space between two immune cells, cytoskeletal forces arrange the complexes of activating and inhibitory ligand/receptors for appropriate immune response. Environmental cues, ligand/receptor expression ratios, and specific receptor orientations come together in a dynamic fashion to determine whether a T cell is going to respond to a given antigen or recognize it as harmless. It is at these critical moments of T cell differentiation where Alpine’s proprietary platform can be used to modulate the spatial arrangement and signaling of multiple targets in protein complexes. Alpine builds upon the complexity of native IgSF domains and their ability to operate within the immune synapse, engineering additional properties to make them more effective pharmacological agents. Our vIgD technology is rationally designed to exploit both known and unknown interactions at the immune synapse. By utilizing a process called “directed evolution”, we create a better understanding of these complex interactions and are able to select proteins to pursue therapeutic objectives for patients living with cancer, autoimmune/inflammatory conditions, and potentially chronic infectious disease. Alpine Immune Sciences recognizes the importance of the temporally and three-dimensionally complex molecular interactions at the immune synapse. Our platform technology rationally exploits these interactions at the immune synapse. Through a process called “directed evolution”, we engineer proteins native to the immune system into potent molecules to pursue therapeutic objectives for patients living with cancer, autoimmune/inflammatory conditions, and chronic infectious disease. Our powerful platform technology is capable of optimizing native immune system proteins for potential use as therapeutics. For example, proteins can be engineered to better bind single or multiple counter-structures with higher affinity than the native protein. They can even be engineered to interact with known specific cognate ligands while simultaneously gaining or losing the ability to interact with other counterstructures. In cancer, the immune system is often suppressed by inhibitory signals (or due to lack of costimulatory signals) within the tumor microenvironment. We believe our vIgDs can stimulate the immune system by delivering an activating signal, blocking an inhibitory signal, or both. The potential of vIgDs to modulate multiple inhibitory and/or activating pathways simultaneously for the treatment of cancer is a powerful and novel attribute of our scientific platform. In autoimmune and inflammatory conditions, the immune system has become overactive and mistakenly attacks healthy cells. Our vIgDs are potentially capable of delivering an inhibitory signal, blocking an activating signal, or both—potentially diminishing the severity of autoimmune and inflammatory conditions. The distinctive ability of vIgDs to engage multiple targets simultaneously may eliminate the need for costly multi-drug combinations. vIgDs may have novel cost and efficacy benefits over other therapeutic modalities such as monoclonal antibodies (mAbs). The smaller size of vIgDs and the fact they are based upon natural participants in the immune synapse may mean they can access the physically constrained immune synapse better than mAbs and other larger protein therapeutics.